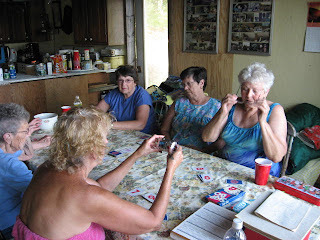 Here's Jeanie, Pat and June facing us and Ma and Lois Ann with their backs to us doing what we do best, eating and playing cards. 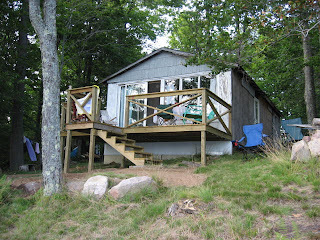 We were up at camp in St. Lawrence County in August 2007 when this picture was taken. There were nine of us there that week including the three Lavens girls, Darla, Dennise and Donna Lee and myself. We try to meet several times a month at one of our homes. Lunch, card playing and show and tell is the agenda. Ma (Wanda Lidell) left us at age 93 on September 2, 2008. We all loved her and miss her so much. Jeanie and Pat are her daughters. Pat is married to my cousin Chuck. They moved from Marathon, NY to Arkansas a few years back.